As a company that touts the benefits of a full end-to-end BI solution, we certainly know the value of a data engineer. The data engineer’s job is to extract, clean, and normalize data, clearing the path for data scientists to explore that data and build models. To do that, a data engineer needs to be skilled in a variety of platforms and languages. In our never-ending quest to make BI better, we took it upon ourselves to list the skills and tools every data engineer needs to tackle the ever-growing pile of Big Data that every company faces today. First, let’s start with basic language skills. Python and R are the most widely used programming languages. While there are lots of other programs, according to our data engineers here in Sisense, there is a growing adoption of Python and R. Every data engineer should not only know the ins and outs of these languages but take refresher courses once a year to stay in the know. Python: A high-level programming language for web applications, Python is listed in about 64% of all job descriptions for data engineers. Python is very easy to learn, and one of the most powerful programming languages. Real Python offers a First Steps with Python course that is built to get you started. And don’t forget to take advantage of all the bonus materials they provide like python tips and tricks, and notifications when new tutorials become available. If you just want to brush up on Python, GitHub has a refresher course that is worth taking. R: Coursera offers a training course for R Programming online that is part of the Johns Hopkins University. What our data engineers like about this course is that it is geared towards the data scientists and covers practical issues for statistical computing. This keeps you focused on what the data scientists need from you. You can do it on your own time as the entire course is offered online. Data engineers also need to have in-depth database knowledge of SQL and NoSQL since one of the main requirements of the job will be to collect, store, and query information from these databases in real-time. SQL: Learn how to communicate with relational databases through SQL. In this course, you’ll learn how to manipulate data and build queries that communicate with more than one table. And what we like best about this course, is that you will practice what you learn with four projects throughout the course that really hone your skills. MongoDB (or NoSQL): An open source Database Management System (DBMS), MongoDB uses a document-oriented database model. That means that instead of using tables in rows in a database, MongoDB is made up of collections of documents. As a simple, dynamic and scalable database, the motivation behind the language is to allow you to implement a high performance, high availability, and automatic scaling data system. Get ready data engineers, now you need to have both AWS and Microsoft Azure to be considered up-to-date. With most enterprise companies migrating to the cloud, having the knowledge of both these data warehouse platforms is a must. And if you really want to pull out all the stops, brush up on Google Cloud Platform (GCP) too. AWS: Amazon Web Services training library from CloudAcademy has over 300 learning paths, courses, and quizzes to get you started and certified. Microsoft Cloud Azure: Microsoft Azure training library comes complete with an initial content selection that gets you excited about MS Azure, then lets you go on to certification, machine learning and AI, and even data management solutions. Google Cloud Platform: Google Cloud Platform training library covers the core principles of the GCP. Start quick with the fundamentals and move on to certification and machine learning. Don’t skip the Google BigQuery learning path and test your knowledge on the Analytics for Google quiz under the data management solutions. PostgreSQL: this is one of the most popular data warehouses as data engineers find it easy to do analysis using PostgreSQL reporting tools. This tutorial will get you started with 16 sections that cover all the details. 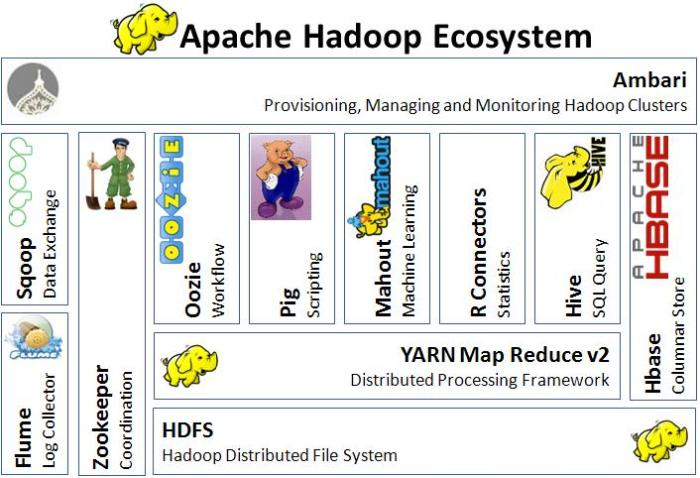 Hadoop: This is the main framework for processing Big Data. It is open source software that is used when there are large volumes of structured and unstructured data that need to be analyzed. Hadoop is known to be fast, meticulous, and low cost, making it a favorite choice among enterprise companies that want to leverage their Big Data for better business decision making. PIG: Pig is a high-level scripting language that is generally used by researchers and programmers in the Apache Hadoop ecosystem when data is highly unstructured. Pig’s motto is “Pigs eat everything” because unlike some of the other platforms for analyzing large data sets, Pig does not require any type of strictness. Pig is mostly used by programmers when the data is unstructured, and the records have different types. Hive: Mainly used by the Data Analysts for creating reports, Hive directly leverages SQL and is easy to learn for database experts. Udemy offers Apache Hive courses for all skill levels, from free tutorials to paid courses. The paid courses come with a money-back guarantee which is a nice amenity for trying out different courses. MapReduce: The distributed processing framework of the Hadoop ecosystem, MapReduce is often referred to as the heart of the system. Any data engineer should learn how to use MapReduce to filter, sort, and basically map and reduce data sets. IBM does a great job of describing the basics of the framework here. Apache Spark: This unified analytics engine for Big Data processing was created in 2009 as a replacement for MapReduce. Spark is similar to MapReduce as it lets you process data distributed across tens or hundreds of machines. The difference is that Spark uses more memory to produce faster results, and it has a more straightforward and cleaner API. You can also go straight to the Spark site to work on the basics. Kafka: This is the technology you will need to learn for real-time data or data in motion. Real-time analytics are used when companies want or need to get insights or draw conclusions immediately after the data enters their system so they can act without delay. Use this open source tutorial to train yourself with real-time applications, and hands-on integrations with Big Data. The role of the data engineer will continue to grow so a grasp of Machine Learning is inescapable. Today, software engineers are starting to work with Neural Networks, and the data engineers will need to prepare the necessary data pipelines to feed these neural networks. A basic understanding of Machine Learning (ML) will help support software engineers as they shift to more AI-based programming and analysis. Machine Learning and AI: Our friends at Coursera have a put together a course with the most effective machine learning techniques. We particularly like the section that shows off the best practices of Silicon Valley in innovation as it pertains to machine learning and AI. With every company now collecting and storing every bit of data created, the data engineer is going to be one of the most important jobs in the company. We know that our list of skills and tools will need to grow and adapt along with the position—so we will keep everyone posted on the updates as time goes on. The rest, though, we will have to leave up to the competent, talented data engineers reading this post.